Flying Machines evokes the products of Leonardo's obsession with birds and flight, and is full of surging, exuberant broken chords. Sixty Beggars refers to a stipulation in Leonardo's will that his funeral cortège should include these among it. Mordents and rather smudged harmonies prevail amidst funereal tones. Old Man with Water Studies relates to a drawing of a seated old man, probably a self-portrait, and adjacent, unrelated sketches of rivers in motion (all available scraps of paper being used!). My piece tries to mix both ideas. Study of a Woman's Hands is a graceful drawing (seen by the composer in Leeds, when on tour); so this is treated musically to a berceuse-like lilting. The Kite of the Cradle is an almost ecstatic rhapsody. 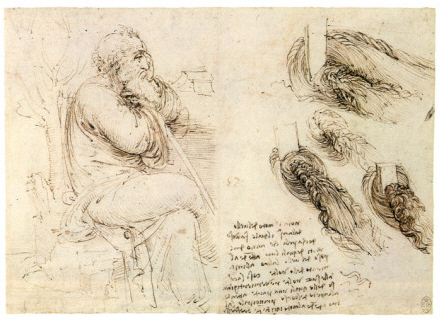 Leonardo talks of his early memory of a hawk landing on his cot (highly unlikely, and he was just a baby, but it is symbolic of his conception of his gift's origins perhaps).